Homemade ice creams are the recent hit in my family. 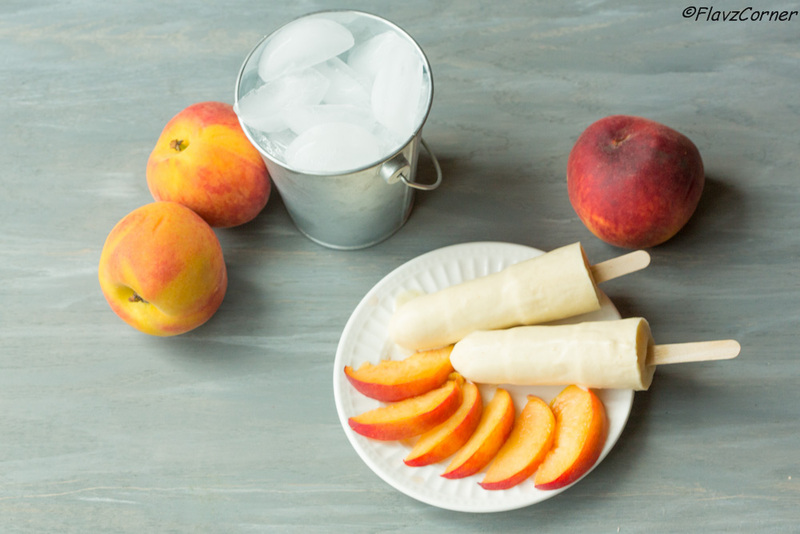 Since the sun started to show up last few weeks, I am making batches of these homemade ice creams in pop sickle form and they are well received by my kids and I got raving comment from my neighbor who happened to taste it. My first trial was with dark chocolate ice cream and it was my kids' all time favorite ice cream, which never got a chance to be photographed. I was astound by the fact that these fruit ice creams I made never attained the same color as we get from the store bought brands. It reveals the role of artificial color in the store brought brand ice cream. My attempt to make a low fat version of ice cream didn't get any further when I found out the additives/ingredients that was added on the low fat creams available, which turned out to be more processed than the full fat creams. So I went with the full fat cream and low fat milk to balance the difference, but I must admit, they were so creamy and delicious. My kids had given me another list of flavor to try on, so I will be experimenting with more flavors pretty soon. Here are the 2 real fruit flavored ice creams I made couple of weeks ago. Out of the 2 versions, Peach ice cream was my favorite. Puree the strawberry with 1/4 cup sugar and keep it aside. 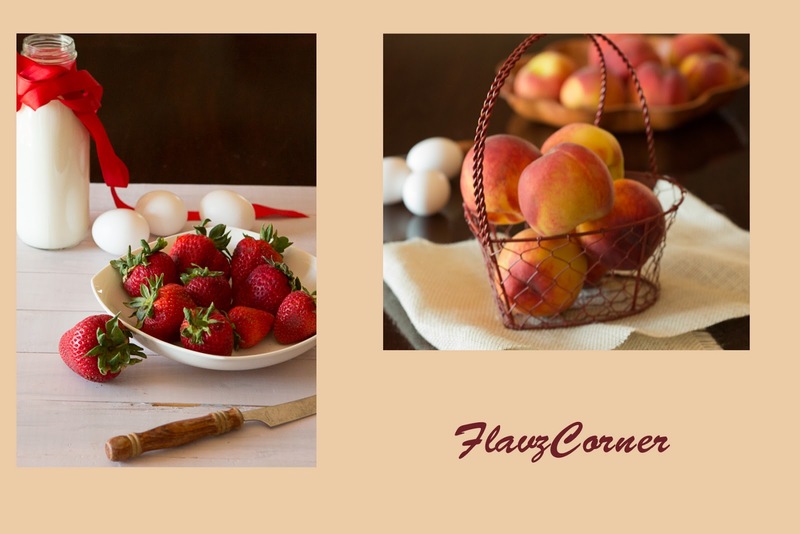 Puree peaches with lemon juice and sugar and keep it aside. Whisk 4 egg yolks well in a bowl. Take a heavy bottom sauce pan and add milk, whipping cream, salt and sugar and bring to simmer. Take one cup of the hot milk and cream mixture and gently pour into the egg yolk and whisk continuously till well blended. Now pour the egg yolk mixture into the sauce pan by stirring continuously with a wooden spoon. Cook the custard stirring continuously till you notice a thin coat of the custard gets on the back the spoon when the spoon is taken out of the mixture. This is the right consistency. Divide the mixture into half by separating into 2 1/2 cups in 2 bowls. To the first half add the strawberry puree. To the second half add the peach puree. Cover the bowls with plastic wrap and refrigerate overnight or a minimum of 4 hrs. 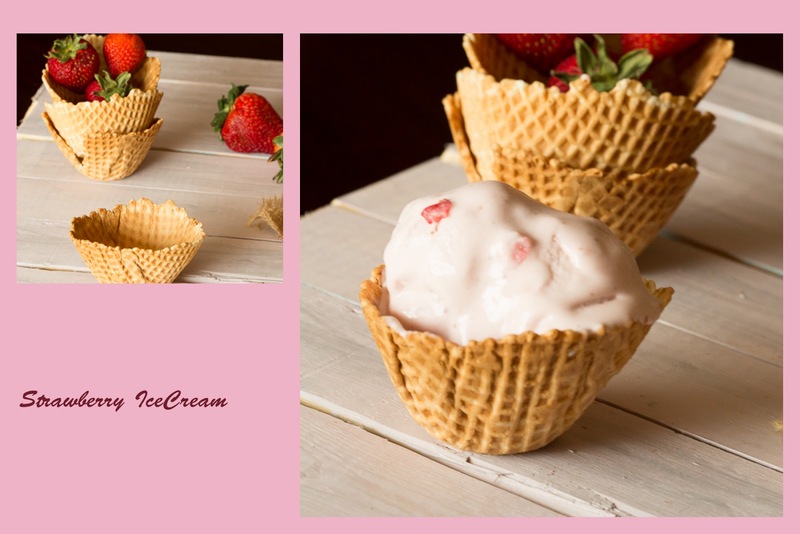 Add the chopped fruit pieces into the respective ice cream mixtures and churn the ice cream mixture in a ice cream maker according to to the manufacture's directions. 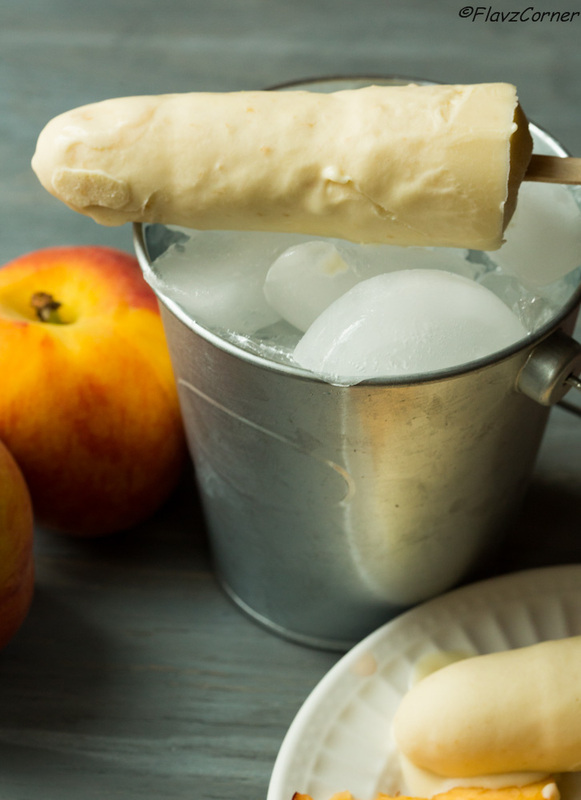 Or you can pour them into pop sickle molds and freeze till they are ready to enjoy. You can use any fruit of your choice. If you are using any fruit that changes color after cutting, use lemon juice with it to prevent oxidation. We prefer less sugar in our ice creams. If you need more sugar, feel free to add more. WIsh I had an IceCream machine....these look sinfully good SHibiiiiiii....Super!!! I love homemade ice cream! My wife and I were just talking at lunch today that it's really time we drag out ice cream maker out of the basement and start using it again. Maybe to make this - wonderful flavor! Thanks so much. 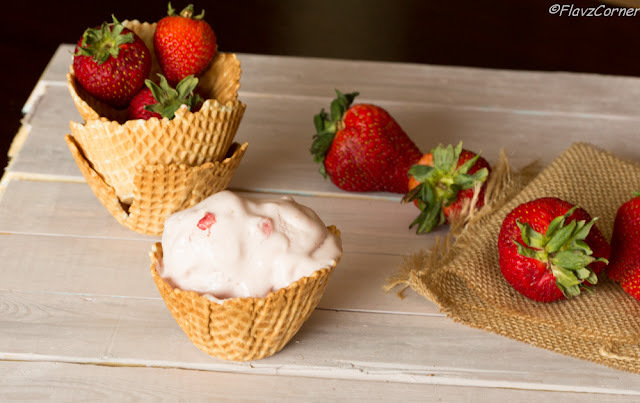 these look great Shibi, and I am especially eyeing the waffle cones, are they homemade too? Always a struggle to do homemade ice cream cones! Thanks for stopping by at my space!!! The waffle cones are not homemade.